WHAT’S NEW WITH THOSE OLD DINOSAURS? Eggs. Feathers. Hunting packs. Dinosaur fossils are giving paleontologists tantalizing dribs and drabs of evidence as to all sorts of things these days, evidence suggesting not only what dinosaurs looked like, but how they may have lived beginning with the moment they hatched to the way they moved, to how they hunted, to how they interacted with their own species, and so much more. A lot of this was presumed to be unknowable when I was in college, back when all that paleontologists had to study were the bones that happened to have survived for tens or hundreds of millions of years. Plus, more and more intriguing specimens are being discovered and described every day from every continent, even Antarctica. For a science fiction writer like me, all this means that September is the time to begin a new chapter in my education. I’m looking forward to taking Dino 101 again. Whew! They sure don’t make those Mesozoic critters like they used to. 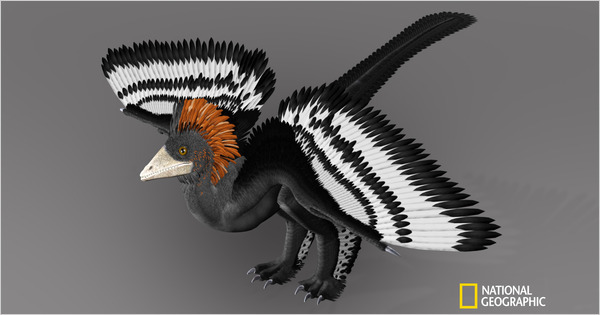 Final note: A (virtual) gold star goes to those of you who recognized that this distinctive looking dinosaur comes from China and has been named Anchiornis huxleyi.